John's Labour blog: Why despite 3 profit warnings did the Tory Government keep giving Carillion public contracts? Because its Chair was a key supporter? 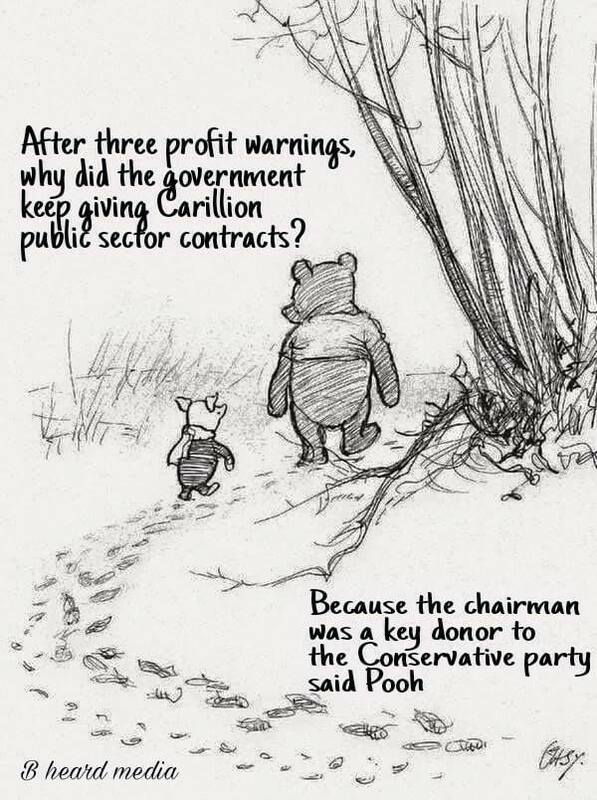 Why despite 3 profit warnings did the Tory Government keep giving Carillion public contracts? Because its Chair was a key supporter? Not sure he was a donor but Carillion Chair, Philip Green, was an open Conservative supporter. The corruption of public life in national politics (and local politics) is just appalling. Left and right politicians can be corrupt, but this current Tory regime is simply beyond the pale. I found out at the Newham Governor Forum tonight that the only school in Newham with a Carillion contract is able to carry on (due to a willing subcontractor). Many other public bodies with more exposure to Carillion are running around trying desperately to maintain services. Just a thought. If we could nationalise the banks in 2008 when they went bust, why can't we nationalise Carillion now? The NHS staff on the inside of the crisis. "Protect our rights at work after Brexit"
"Harry Constable - in his own words"
Five ways to encourage new young activists? "Staff and parents protest against academy plans"